Each journey is a story to remember, a unique experience. We are part of many stories, in every trip we do, be you part of our story. 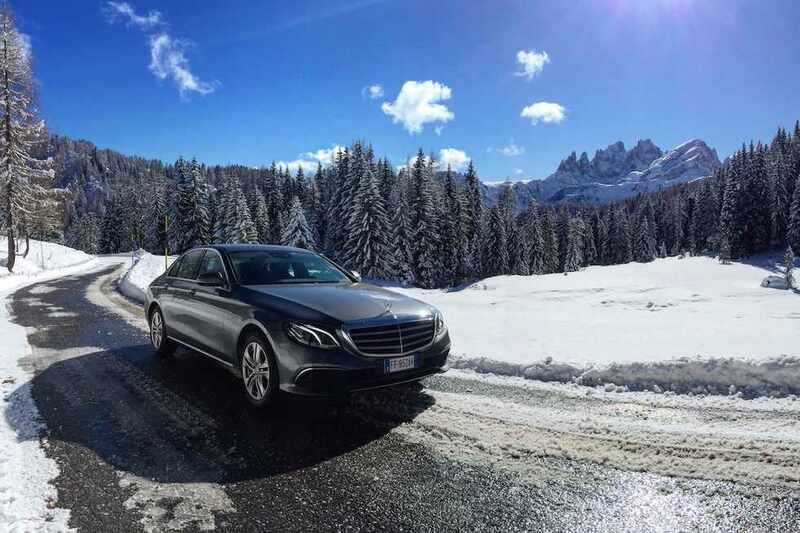 Transfer service from and to airports or railway stations, taxi in Moena, Campitello, Canazei and all around the Val di Fassa and the Val di Fiemme. But also tour and escursion by bus towards every destination. Those are our transportation services, everywhere you need at any time 24/7 with new and always in a good shape and clean vehicles. Because small details make the difference. Our company, located in Moena, offers a taxi service in Val di Fassa, in Val di Fiemme and to any other destination you need: Taxi in Moena, taxi in Canazei and Campitello. We offer a transfer service by car, van, minibus and bus from 1 passenger up to 56. Transfers to Moena, Pozza, Campitello and Canazei. Transfer to the Val di Fassa and to the Val di Fiemme from airports in the North of Italy, Innsbruck or München. Tours and escursions by bus around the Dolomites, Italy and all Europe. Our purpose... we always offer the best service as possibile. Quality, experience, professionalism, affidability and timing, those are all the things that we care about. We are proud of our services, because our idea is to do our best, always. In our company we always want to provide the best transportation service we can, improving often our vehicles garage, keeping our vehicles clean like brand new and make you comfortable in every trip. We offer a private passengers transportation: taxi and transfer services by cars, minibus and busses using well known brands such as Mercedes Benz for their comfort and quality but also Volkswagen for their good 4 wheels drive (4x4) and safetyness on the snow. In the Val di Fassa and the Val di Fiemme we still have four seasons. 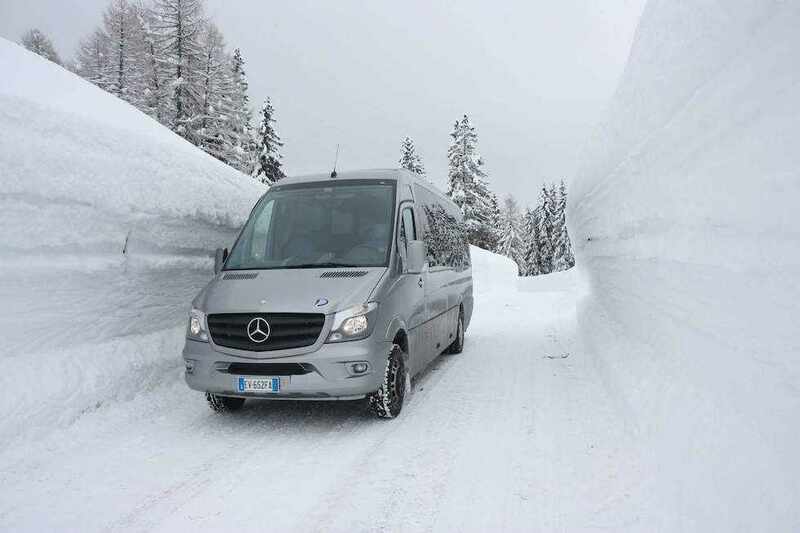 As a local mountain transportation company, located in Moena and Canazei in the Val di Fassa we are equiped and ready to work with the most bad road conditions such as snow and ice. Essendo un impresa locale con sede a Moena in Val di Fassa siamo attrezzati ad operare con ghiaccio e neve. All our vehicles are equipped with new winter tires and chains always on board. We also have vehicles with 4 wheel drive to ensure the highest safety. We take care about your journey, just relax. All our vehicles are covered by insurance policy to a maximal of 30 million euro, they also are equiped with the most modern electronic systems on the market to ensure always the best kind of service, the best safety and comfort for passengers. Our company operates in the Val di Fassa and Val di Fiemme, Moena and Canazei, and over the whole area of the Dolomites since 1940. We are based in Moena a little village in the Val di Fassa, hearth of the Dolomites. We offer transport services as taxi and airport transfer from the Val di Fassa and the Val di Fiemme, towards every destination. Available 24/7. Book in advance your transportation such as taxi in the Val di Fassa and the Val di Fiemme or transfer to airports and railway stations. Get in touch with us to get informations. We are always available and on time. All our vehicles are often inspected by official garages. We work with vehicles branded Mercedes-Benz and Volkswagen, always new and clean, because we want to offer an high quality transportation service. Each journey is a different and unique story to remember. Our journey, long three generations. 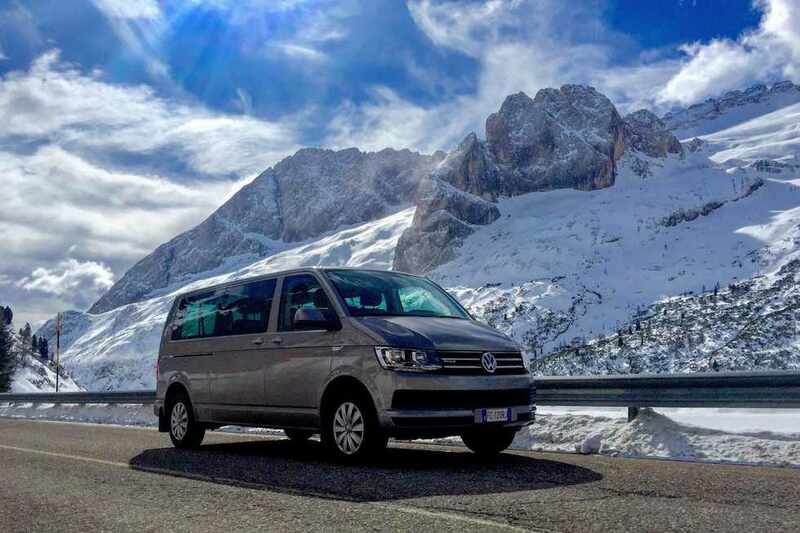 Our story since 1940 the firm Taxi and Bus owned by Franco Desilvestro, has been transporting passengers, providing taxi and transfer services by car, minibus and bus all around the Dolomites but precisely in the Val di Fassa and Val di Fiemme. We have been always focusing on three aims: quality, comfort and safety. We carry out this motto, periodically revising and improving our means of transport, in order to satisfy our customers’ requirements. All our means of transport are covered by insurance for a maximal of 30 million euro; moreover, they are equipped with the most modern electronic systems available on the market, in order to assure the best service, the best safety and the greatest comfort to the passengers at all times. These characteristics, together with the long work experience in transporting people, with the expertise of the owners and with the will to improve our services, are our way of wishing you a good journey. In the Val di Fassa and the Val di Fiemme every season has its own beauty.